Stephanie Weightman’s award winning Crafting Live show is coming back to Malvern and bringing a whole host of celebrity crafters. The show itself is open on Saturday 23rd and Sunday 24th March, and is open 10am-5pm on Saturday and 10am-4pm on Sunday. Saturday and Sunday will host an array of exhibitors stocking stamps, dies, decoupage, fabric, wool, ribbon, beads and much more. You can stock up on all of your craft essentials, as well as finding inspiration from brand new products and watch on-stand demonstrations. There are also refreshment options and areas to have a much needed sit down after all that shopping! What’s more, every advance ticket purchased is eligible for an exclusive FREE GIFT* specially designed by Stephanie – just collect yours at the show. Plus every guest will get a £5 voucher** to spend with our sponsors Create & Craft. 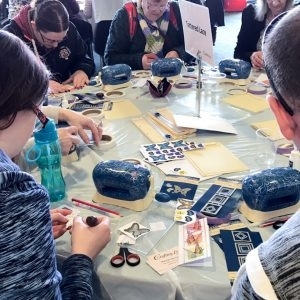 Crafting Live also features a FREE make and take area, a number of well-known crafters will be running these mini workshop sessions, giving you lots of education and inspiration along the way, allowing you to take your finished project home with you. The make and take booking point is open from 10am each day within the show and booking is essential. What’s more, various craft experts will be running masterclass workshop sessions, giving you lots of education and inspiration along the way. And new for 2019, if you’re a budding artist, model maker, crafter or a Wallace and Gromit super fan, you can hone your skills in ‘Shaun’s workshop’, presented by Aardman’s senior model maker Jim Parkyn. 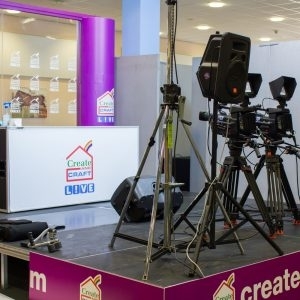 Another main feature of this event is the chance to see Create and Craft TV filming from the show. Keep your eyes peeled as there may be a chance to meet some of your favourite presenters during the show! You won’t want to miss out on what we know will be a fantastic craft event. 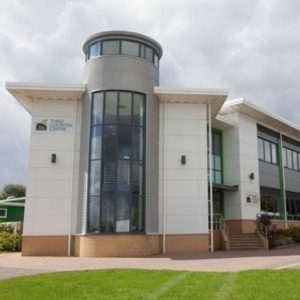 The Severn Hall, Three Counties Showground is a great venue with a variety of facilities including ample FREE parking, disabled car parking, disabled toilets, various food outlets, baby changing, ramp access and cash machine (located on Row 5 of Avenue G). You can find out more about the venue at www.threecounties.co.uk. Please note that only Assistance Dogs are permitted in the show. Please note no overnight parking or camping is available during the show. There will be a number of different catering facilities on-site which are usually open for breakfast and lunch, offering snacks, hot meals, drinks, etc. All buildings have purpose-built or enhanced entrances for disabled access. Internal spaces, including public conveniences and public seating areas, have been designed and laid out to accommodate disabled access at all times. Designated disabled parking bays are situated at the front of the parking area to provide as easy access as possible for visitors. Please be aware we do not offer mobility hire, but you are more than welcome to arrange a scooter to meet you at the show entrance. The Three Counties Showground is located 10 miles from the M5 and M50 motorways, just follow the brown signs from all main routes, so you shouldn’t have a problem finding it, below is the address and directions. Driving (with & without motorway) and walking directions can be found using Google Maps. You can check live traffic information on the day using AA Traffic News. The Three Counties Showground features ample FREE parking, so you should have no problem finding a car parking space at the venue. There is allocated disabled parking at the front of the parking area. Please note that some parking may be on hardstanding and others on grassed areas. We will be running a FREE courtesy bus from Great Malvern train station. The courtesy bus will be running from 9.30am throughout both show days until after the show has finished. There are no set times but you should not have to wait for more than 30 minutes at either the show ground or train station. You’ll find the pick up point just outside the station and the return pick up point is outside the Severn Hall of the showground. Trains run from Great Malvern station between Birmingham and Cardiff. Do you have questions, comments or suggestions? Email us on info@craftinglive.co.uk. If you wish to exhibit at our shows, please contact our event manager, Marlene Carr, on Marlene.Carr@crafting.co.uk, or call (+44) 07495 072495.